With the amount that their name has been thrown around lately, you’d find it difficult to believe that Afterthoughts is Greywind’s first proper release. In the last twelve months, the Irish duo – comprising of siblings Steph and Paul O’Sullivan – have covered more ground than ever before, embarking on their first ever live dates, dropping single after single to enormous response, and building sufficient levels of hype from most corners of the rock media. And thankfully, it’s all been fairly worth it as Afterthoughts wholeheartedly succeeds as an opening salvo. Most of that is thanks to Greywind’s singular aim of writing nothing but anthems, and straight off the bat they’ve got all the necessary components honed to a fine point. Walls of guitars roar, huge drums clatter all over and Steph’s elasticated vocals are primed for arenas already, quiet and porcelain when they need to be before exploding into some positively lung-bursting belting. She really is the central focal point of the album, not only giving the sort of world class vocal performance that most new bands could only dream of, but also by acting as the primary catalyst for the sense of drama that makes it all so compelling. The somersaulting emotion alone aids the tumult, but there’s also the sylvan, fantasy-esque lyrics in Forest Ablaze and the title track that elevate Greywind above typical alt-rock mundanity and into their own separate world. And acting as the engine room to drive the goings on in this world is Paul O’Sullivan’s guitar work, what will probably be the most overlooked aspect of this album. Though his contributions may not be as versatile as his sister’s, there’s still an impressive amount of fluidity in his playing, be it the snow-capped glisten of Safe Haven or Car Spin‘s ploughing riffs. Instrumentally, it’s not totally dissimilar to what Young Guns used to be so proficient at, but whereas over-stiffness has let that band down fast, Greywind give themselves far more breathing room, with songs like Stitch On My Wings being unequivocally polished but still potent. And though the production at its shiniest strays into a lot less forgivable territory – the twinkles around the edges of the acoustic guitars on In Autumn only ramp up an already unnecessarily saccharine track – it’s very rarely leant on too heavily, and because of this it’s so good to hear some guitars with actual firepower on an album like this. On the other side of the coin though, this is a formula that Greywind rely on very heavily, and as such it loses some of its luster at the end with Wander, a track that should serve as the grand climax but merely feels like a lesser version of what’s preceded it. That’s probably Greywind’s biggest problem, in that they’re not very good at restraining themselves, and as a result the near constant expanse that’s present on Afterthoughts‘ becomes tiring, and as yet hints that they could do with adding a few more strings to their bow. Even when they do try for something more downplayed, the result is the beige, acoustic-led track In Autumn that leaves little to no impression. Desolate is a more successful attempt at a more compact track, but there’s still a very tangible anthemic quality at heart thanks to Steph’s pipes. They’re undoubtedly powerful, but particularly on her higher belted notes, she can make it seem like hard work, only adding to the maelstrom of Greywind’s sound that forms this album’s framework, but that can also make it come across as unwieldy in places. But at the end of the day this is a debut album, and for a band as precocious as Greywind, any problems are bound to be resolved sooner rather than later. As it stands now though, Afterthoughts is the first stepping stone towards absolutely monstrous things. There’s so much done right here, especially the balance between production and organic fidelity, that it’s difficult to focus on any negatives and embrace Greywind as the British Isles’ newest addition to the A-list alt-rock fray. Alright, that may be pushing it slight – the real lack of diversity and detail holds Afterthoughts back from being something truly special – but if this is a sign of what’s to come, then Greywind are in for one hell of a ride. 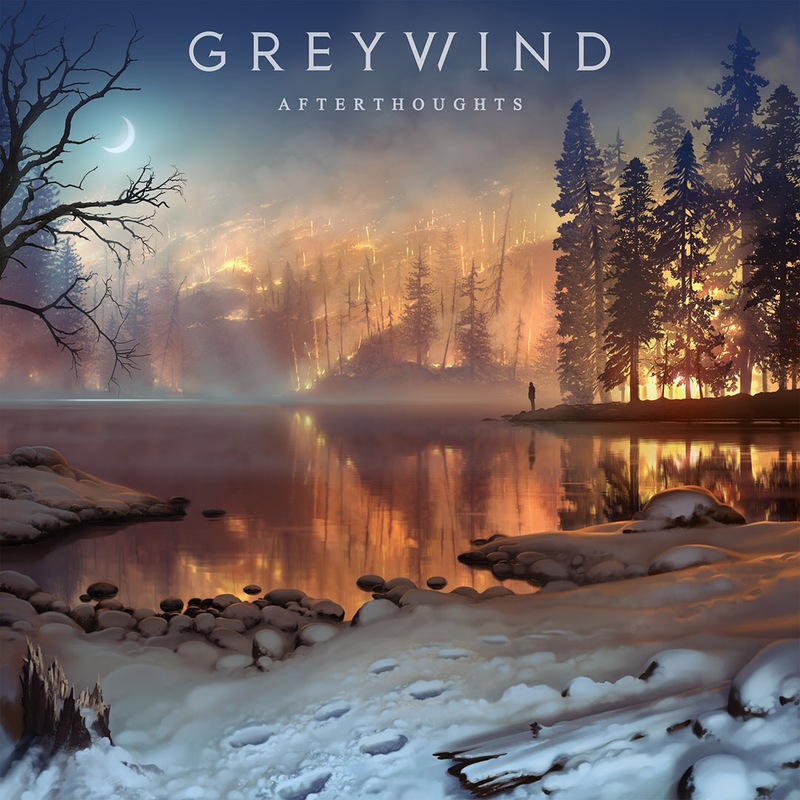 ‘Afterthoughts’ by Greywind is released on 27th January on Spinefarm Records.